Author and political activist Jack Herer showed up at the Dance Palace in Point Reyes Station Monday evening to publicize the “California Cannabis Hemp & Health Initiative 2008” signature drive. 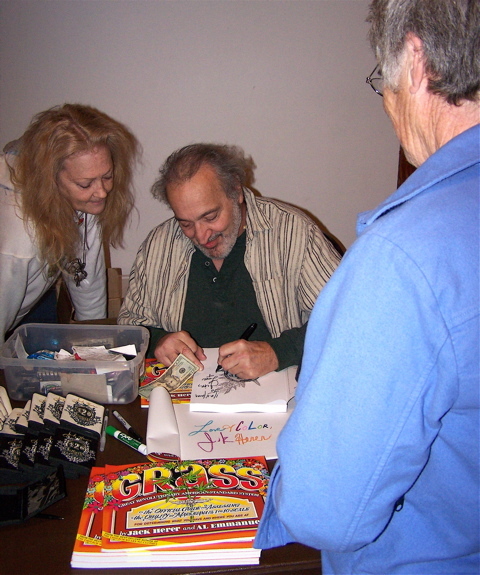 Herer signs a copy of one of his books, Grass, for Elizabeth Whitney of Inverness. Linda Sturdivant of Inverness Park (at left) helped organize Monday’s meeting. Attendance was light, probably because in West Marin Herer was preaching to the choir. Monday’s event began with a movie, Emperor of Hemp (narrated by actor Peter Coyote), about Herer’s 50-year campaign throughout the United States to legalize cannabis sativa, both the smokable and non-smokable varieties. In the film, Herer is seen evolving from a conservative military policeman in Korea after the war to an advocate for growing hemp for fiber, food, and fuel. Appropriately, Herer says his interest in cannabis sativa occurred after a girlfriend convinced him to try smoking pot. Not only did the euphoria make him see the world differently, he became a different person. Herer went from a Goldwater Republican to an advocate for legalizing cannabis — both for enjoyment and medical purposes. Equally significant, he became an advocate for growing industrial-grade cannabis to replace wood in paper, for use as fuel and lubricants, for cooking oil etc. 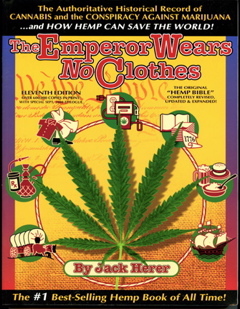 As Herer pointed out in his repeatedly reissued 1985 book The Emperor Wears No Clothes, hemp was used for thousands of years to make paper, cloth, oil (from its seeds), and innumerable other products. In 1937, however, the US government outlawed personal use of pot and outlawed even the growing of industrial-quality hemp despite outcries from the medical community, among others. The absurdity of banning a valuable crop became evident a decade later when, as Emperor of Hemp shows, a US Department of Agriculture film described hemp farming as a patriotic part of the war effort — even though it remained illegal. The federal government continues to ban hemp farming (although industrial-grade hemp contains too little tetrahydrocannabinol to create the effects associated with pot), and hemp products sold in this country are all made with imported hemp. Emperor of Hemp quotes the government’s argument for banning a valuable crop as being that police would have trouble determining which cannabis was legal and which was illegal, so allowing industrial-grade hemp growing in the US “would send the wrong message to our children.” Huh? Emperor of Hemp contains interviews with people from the medical community, academia, and the National Organization for the Reform of Marijuana Laws — all saying that what Herer preaches is on target despite his bombast. Even NORML, who for years didn’t want to associate itself with Herer’s “Hemp-will-save-the-world” rhetoric, now recognizes the aging activist’s writings have made the public understand the false premises behind the government’s war against cannabis, the group’s executive director says in the film. Herer has now authored the Hemp Initiative in an attempt to make California law reflect reality. As Herer said Monday, signatures are being collected for the state initiative, with 434,000 valid signatures needed by April 5 to qualify for the November ballot. In any initiative drive, a large number of signatures are invalidated, so organizers of this campaign hope to reach three million signatures in the next two months. The initiative would legalize the growing and selling industrial hemp, would bar state law enforcement officers from helping federal agents enforce federal anti-marijuana laws in California, would legalize marijuana smoking for religious purposes, would legalize adult use of marijuana for euphoria as well as medicine, and would set standards for non-commercial cultivation of marijuana. To publicize the initiative drive, three-day “Hip Hop for Hemp” festivals will be held in Northern and Southern California. Seeva Cherms (left), the daughter of Linda Sturdivant, is handling publicity, and Wednesday she told me 24 bands and several internationally known reggae and rock stars have already agreed to participate. For the moment, Seeva added, the identities of the biggest names cannot be announced, pending arrangements with their recording companies. People who want to keep up with festival plans will soon be able to check a new Hip Hop for Hemp website. 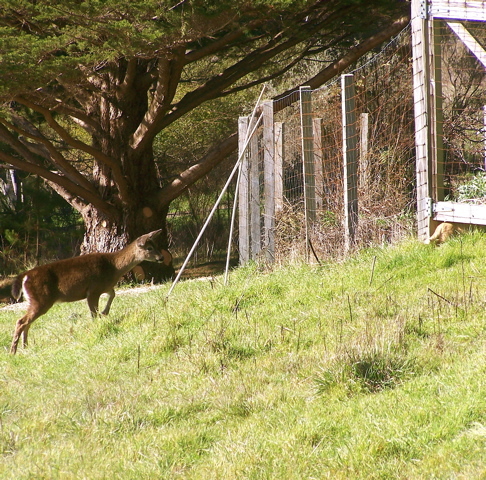 An operation aimed at eliminating a herd of axis deer near Marshall Beach in the Point Reyes National Seashore was abruptly halted Monday morning after numerous news organizations learned of the killing and showed up to report on it. The killing was being carried out by riflemen from a firm called White Buffalo, which the National Seashore hired last year. White Buffalo had planned on using helicopters to herd the axis herd into ravines where they could be gunned down en masse. However, the shooting stopped after 18 deer out of a herd of 80 were killed. “It looks like we might have successfully stopped the axis-deer slaughter that was scheduled for early this morning,” a pleased Trinka Marris of Inverness Park said later Monday. Trinka had organized protests this morning on Marshall Road and at the Bear Valley headquarters of the park. Approximately 20 protesters took part, including representatives of WildCare and In Defense of Animals. “The park had blocked the roads, and the White Buffalo helicopters were launched, but when our protest showed up at the roadblock [not far from Marshall Beach], with camera and reporter in tow, the word got back to park headquarters,” Trinka recounted. 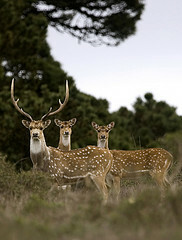 Hired with grant money, a company called Full Court Press has been getting publicity for the axis and fallow deer’s plight in the Point Reyes National Seashore. Monday evening Trinka told fellow protesters, “Thanks to the remarkable firm that has been hired to help with this campaign, by 10 a.m. the park was crawling with new crews from ABC, NBC, CBS, KTVU, and The Independent Journal. Earlier today Trinka reminded me that the park has consistently refused to let the public see how the killing is done. White Buffalo is under contract to kill fallow and axis deer in the park through June, at which time the eradication program must be reviewed and a new, one-year contract signed, Trinka said. Members of Congress and the California Legislature have asked the Bush Administration’s Department of the Interior to at least temporarily stop the killing until it can be thought through better. The National Seashore, however, has responded that under the government’s contract with White Buffalo, it can’t afford to stop. On Monday, Dr. Elliot Katz, president of In Defense of Animals, countered by offering to pay the rest of this year’s contract with White Buffalo. The veterinarian made the offer directly to both White Buffalo during the protest on Marshall Road and to National Seashore Supt. Don Neubacher during the protest at park headquarters. The Neubacher administration has told the public that the main reason for killing off non-native deer in the park is so they won’t compete with the native blacktail deer for forage. Pressed by the press today, however, the park superintendent conceded that White Buffalo’s riflemen sometimes shoot a few native blacktails that are hanging out with the fallow and axis herds. The park’s claim that there would be more native blacktail deer in the park if the axis and fallow were not eating so much forage is, of course, sheer propaganda. The buildup of brush and dry grass is annually such a problem that the National Seashore regularly conducts controlled burns to reduce the risk of wildfires. 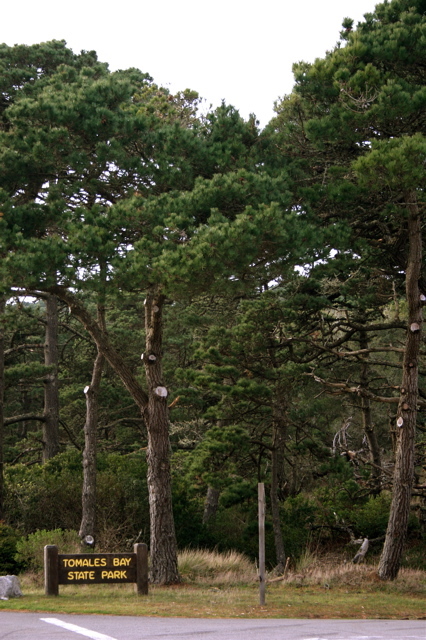 Providing the biggest check on the blacktail population of federal parkland here, as can be seen along Highway 1 from Muir Beach to Marshall, are motorists. Fresh carcasses of deer struck in traffic are daily sights in West Marin. This is hardly surprising now that the National Seashore attracts more than 2.2 million visitors annually — and neighboring Golden Gate National Recreation Area lands, hundreds of thousands more. Update as of Wednesday evening: Demonstrator Saskia Achilles, who has continued to track the axis-herd eradication, just reported, “All road access is blocked by park rangers in trucks when the hunting is going on, so I have only been able to get close on foot — and not at night — but I see their helicopters in the deer’s valley, and I see nets with a heavy load getting carried by the helicopter…. 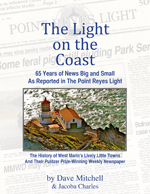 “Point Reyes Light publisher Robert Plotkin and former publisher David Mitchell have reached a settlement of their pair of lawsuits and countersuits, which involved financial and non-financial matters. While I watched from my deck last Friday, a blacktail doe spotted a housecat near neighbor Dan and Mary Huntsman’s fence. 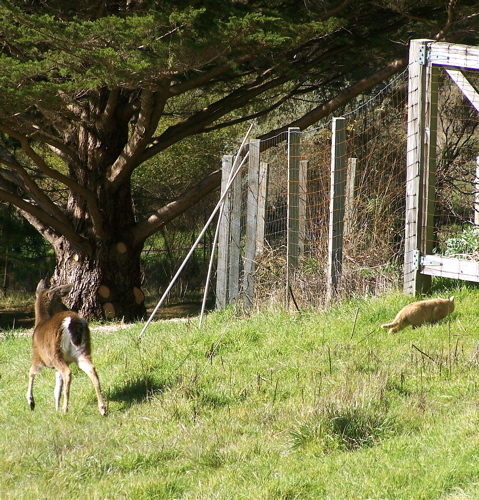 The doe took great interest in the cat’s crawling under a gate. 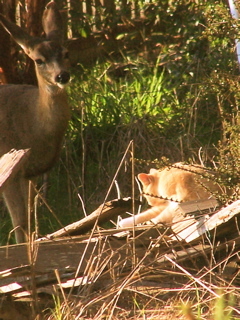 Deer and cats, as this blog has noted previously, seem to get along well, as evidenced by the doe below watching a housecat wash itself on a woodpile. It’s an inter-species attraction that folks around the country have noticed. If you want to watch a deer and cat flirt with each other, two videos on YouTube are particularly fun. The first is made all the more humorous by the chatter, as well as, a radio broadcast, in the background. The second is notable for the persistence of both the cat and deer in bussing each other. I’ve also witnessed similar behavior in my fields between a fawn and a jackrabbit. 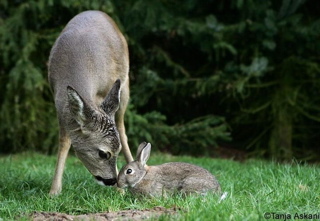 When a curious fawn spotted the rabbit, it began slowly walking up to it. The rabbit stayed put until the fawn started sniffing around it and then hopped under a nearby bush. I didn’t manage to photograph that encounter, but many of us have seen a series of photos depicting the friendship between another fawn and a rabbit. Here’s one from the series, which was shot by German photographer Tanja Askani in Alberta, Canada. Although Governor Arnold Schwarzenegger last Thursday proposed closing Tomales Bay State Park to save money, several knowledgeable people here doubt that will happen — especially if the opposition is sufficiently vocal. 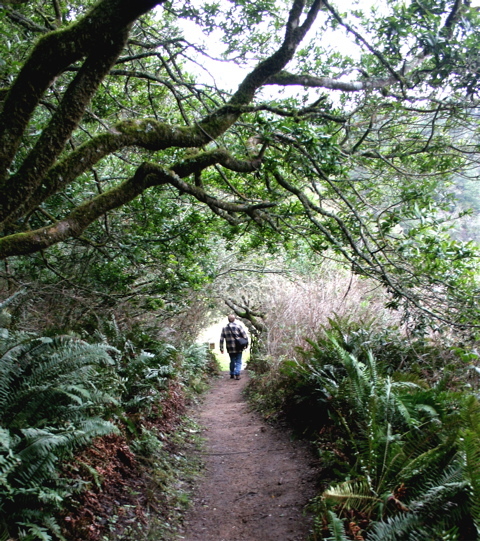 Park visitor Dave LaFontaine of Los Angeles hikes through Tomales Bay State Park. Photos by Janine Warner, founder of DigitalFamily.com. The park, which includes Hearts Desire Beach, Indian Beach, Pebble Beach, Shell Beaches I & II, and Millerton Point totals 2,000 acres. It is among 43 parks statewide the governor wants to close to save a total of $13 million per year. With state-government spending in fiscal 2008-09 now projected to exceed revenue by $14.5 billion, the governor has proposed slashing 10 percent from most departments’ budgets. That would reduce healthcare for 6.6 million low-income people in order to save $1.1 billion a year. Spending on public education (kindergarten through high school, junior college, the state university system, and UC system) would be cut by $4 billion. The governor, whose personal wealth is more than $100 million (The San Francisco Chronicle has reported), proposed that spending on Social Services for poor families be cut by $390 million per year. Schwarzenegger would likewise cut child-welfare payments by $84 million per year. Aid to low-income people who are blind, otherwise disabled, or elderly would be cut by $300 million per year. Care for foster children would drop by $82 million per year. “I have made it very clear we cannot tax out way out of this problem,” Schwarzenegger said. “There’s no reason to tax anyone because our system doesn’t work,” the governor added ambiguously. “The Office of the Governor asked State Parks to come up with a plan proposal for a $17 million reduction for the 2008-09 fiscal year budget (a 10 percent cut)…. Most of the department’s budget is personnel, so the decision was made to eliminate positions by closing a series of parks. “To choose which parks would be proposed for potential closure a set of filters (criteria) was developed. The filters were: 1) Can the park be physically closed to the public? 2) If the park were closed, would it save the amount needed? (In the case of Marin District, [the proposed closure] entails two permanent positions). 3) Closures would have to be spread around throughout the whole state. “It should be emphasized that this is just a PROPOSAL and a lot of back and forth will soon start between the Legislature and the Governor’s Office. I do not think the [Marin] District has started conversations as to what closing Tomales Bay State Park would entail operationally or if there might be other possibilities to achieve the required [spending] cut. 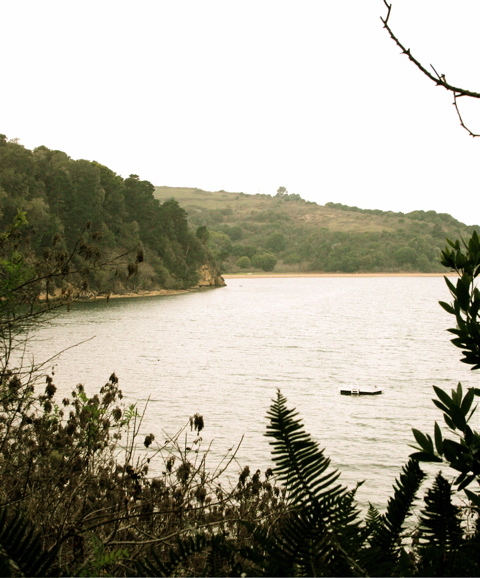 A raft for swimmers at Tomales Bay State Park with Indian Beach in the distance. 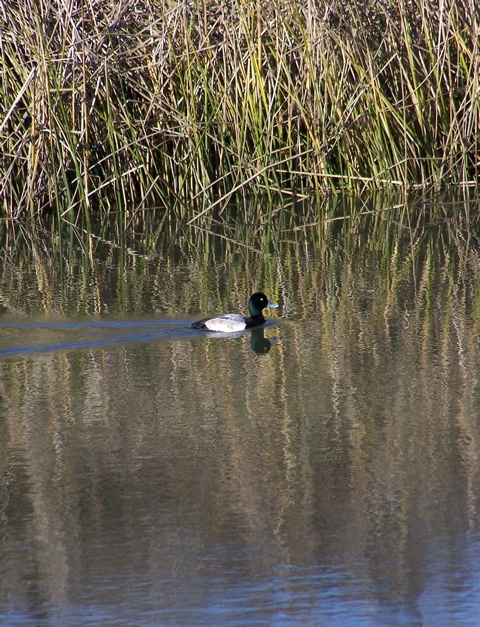 “The closure of Tomales Bay State Park would certainly be a challenge. Although the entrance gate to Hearts Desire beach can be closed, we all know that the State Park beaches are easily accessible by boat and kayaks. Jepson Trailhead and the south boundary trailhead to Shell Beaches I and II are also easily accessible. “I clearly remember having gone through this predicament in the early 1990s, and although a large number of positions were eliminated, park closures never materialized. A lot of [proposals] ended up being part of the process in the political dance between the Legislature and the Governor’s Office. “If the closure of that jewel of the state parks were to become a reality, another big loss would be the Environmental Living Programs that are held at Indian Beach for fourth and fifth graders throughout the school year, a signature program for Marin District. 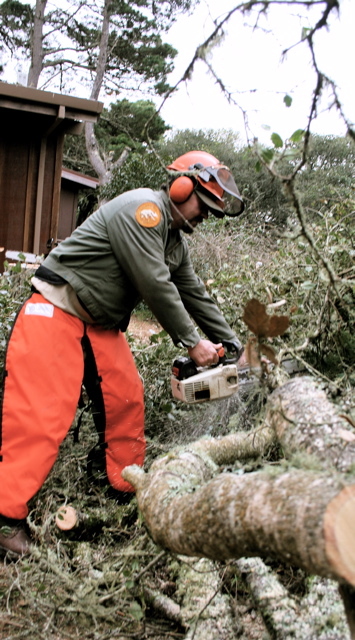 State Park maintenance worker Roberto Barajas on Sunday cuts up trees that fell against a Tomales Bay State Park building in the recent storms. One of those who doubts whether much money can be saved by closing the state park is LeeRoy Brock of Point Reyes Station. A retired ranger at the neighboring Point Reyes National Seashore, LeeRoy was a ranger at Bandolier National Monument in New Mexico when it was temporarily closed two decades ago. There was no way to keep the public off the land, he said, so federal employees were still needed to clean up litter, maintain facilities, and patrol the area. LeeRoy suspects the situation would be the same at Tomales Bay State Park. 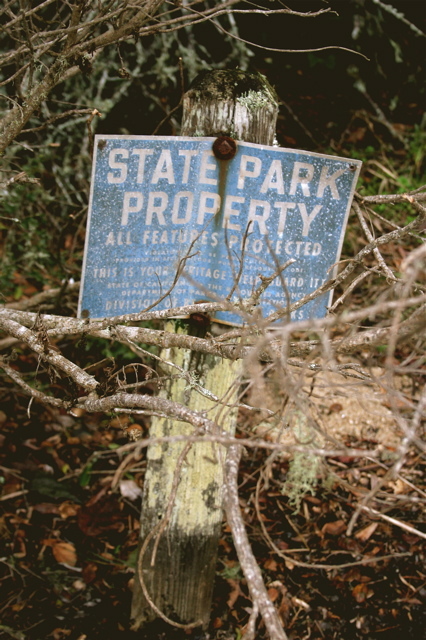 Like Carlos, LeeRoy said there are too many places to enter the park on trails or by boat to keep people out. State facilities, such as those getting park-maintenance workers Roberto Barajas’ and Janet Tafoya’s attention after the last storm, will still need protection from the elements, not to mention vandals. But under the governor’s proposal, there would be no Hearts Desire’s entrance fees to help pay for the work. 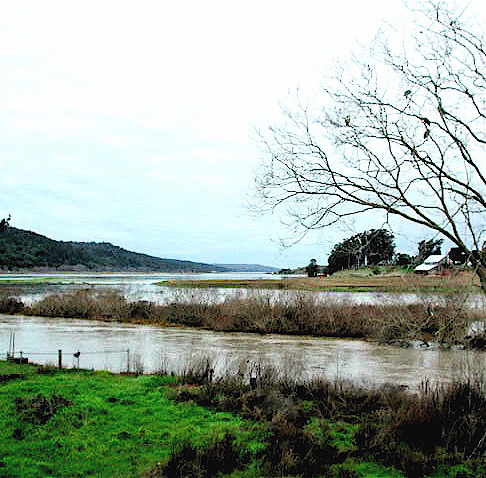 “This week,” Carlos said, “I will be writing to State Senator Carole Migden and Assemblyman Jared Huffman, sharing my concerns and disappointment about the proposed closing of Tomales Bay State Park — or any other parks, for that matter. Tomales Bay State Park is rich in Miwok Indian middens. Its beaches are sheltered from the prevailing wind. And it is geared to families, who can park near picnic tables and barbecues overlooking the bay. How did the park come to be? “Most of the Tomales Bay area lay untouched until the late 1940s, when developers discovered its beauty and began to purchase beachfront lands,” notes the State Park website. Yet after all the work that went into creating Tomales Bay State Park, the future of its land is again in doubt. Old Christmas trees piled behind the Arthur E. Disterheft Public Safety Building in Point Reyes Station this week. 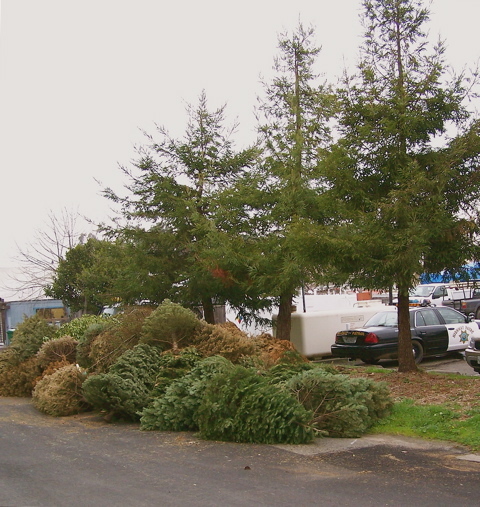 County firefighters each year encourage West Marin residents to drop off their old Christmas trees at firehouses. 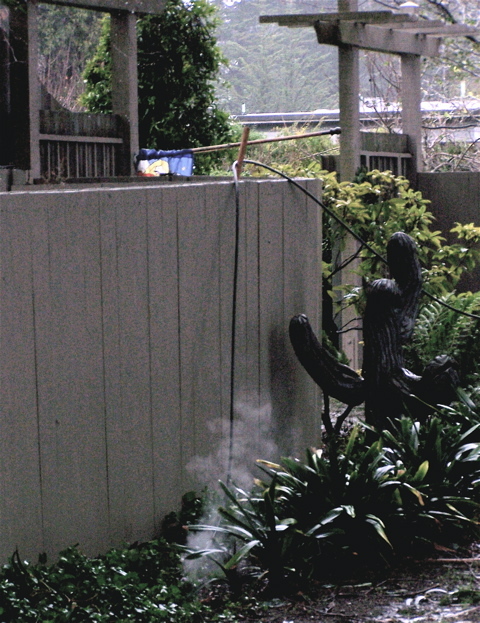 The trees are chipped and hauled off, eliminating the risk of dry trees accidentally catching fire around the house. I dropped my tree off at the Point Reyes Station firehouse Monday after calling ahead to make sure I could do so a day after the recycling program supposedly ended for the year. No problem, I was told. Of course, old Christmas trees shed pine needles whenever they brush against something, so I wasn’t especially happy about hauling the tree in my car’s trunk. “Too bad you can’t just drag it behind your car,” my houseguest Linda Petersen said with a laugh. I could imagine my route to the firehouse littered with Christmas tree branches and cited the State Vehicle Code, which says that when hauling stuff on a public roadway, you must make sure none of it ends up in the road — with two exceptions, one of which you may never have thought about. This allows farmers to transport “livestock,” the CHP officer said. In short, if you’re allergic to feathers, it’s up to you not to tailgate the turkey truck. Wild Turkeys at Dawn. Monday morning I was awakened by 37 wild turkeys gobbling outside my bedroom window. 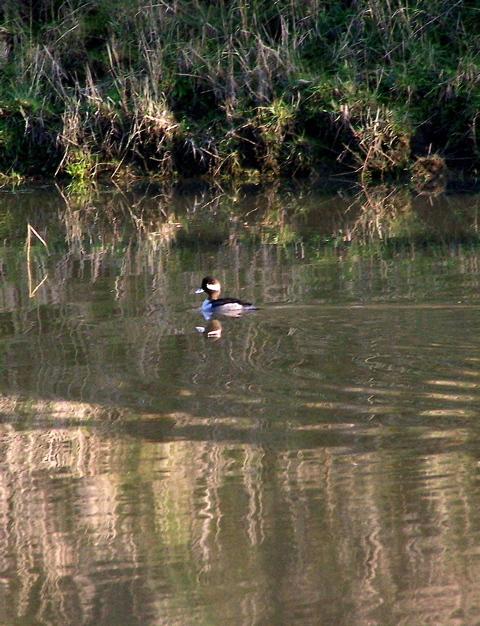 Transported by the sunrise, they dropped few feathers. The non-native turkeys were introduced into West Marin in 1988 by a hunting club working with the State Department of Fish and Game. You can read that story at Posting 76. 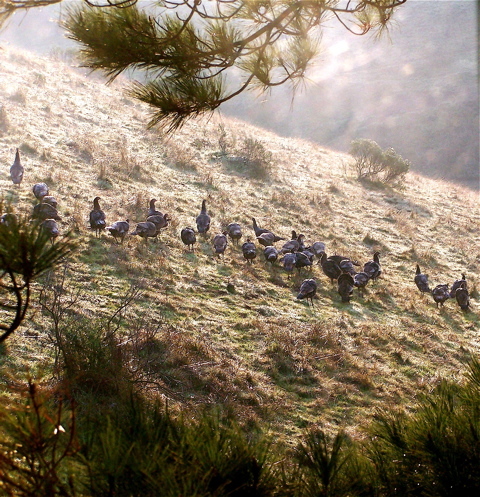 By now there are far more turkeys than turkey hunters, and their flocks have spread throughout West Marin. The advertisement not surprisingly turned out to be a hoax. The perpetrator was an Illinois editor named Willis B. Powell. Parts of the Big Mesa in Bolinas finally had their power restored at 3:30 p.m. Wednesday after being blacked out for more than five and a half days by last week’s stormy weather. Much of the blackout on the Mesa resulted from fallen lines near the Elm Road home of Serena Castaldi. However, pockets of homes on the Big Mesa, as well as the downtown, lost power for only brief periods. High winds, which were clocked at hurricane force on Big Rock Ridge near Nicasio Friday morning, also caused multi-day blackouts in parts of that town and in parts of Inverness. Laura said her home’s on-demand water heater burns propane but has an electric starter, so it didn’t work. Her family, she added, spent a fair amount of time at her brother Ned’s home next door, which also has an on-demand, propane water heater but with no electric starter. In fact, several Bolinas people told me that the worst part of the blackout was going without hot water for almost a week. Jonathan Rowe of Point Reyes Station is known for a number of things. He hosts America Offline on KWMR at 5:30 p.m. Tuesdays (rebroadcast at 11 a.m. Thursdays). He is an advocate for a commons in town. He is a contributing editor to The Washington Monthly and YES! magazines. 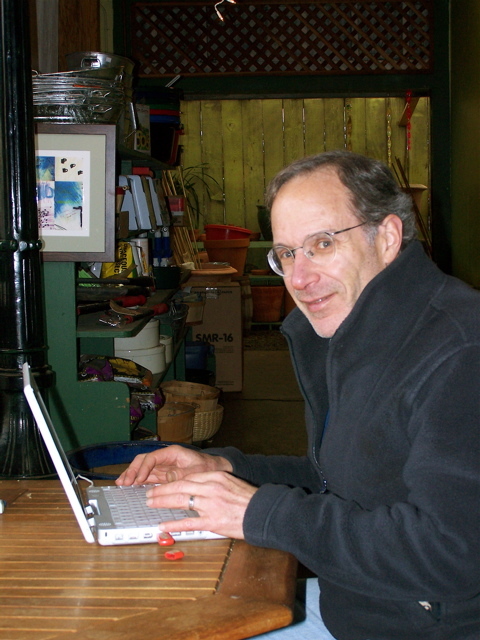 And he seems to do much of his writing on a laptop computer in the open-air coffeehouse at Toby’s Feed Barn. More than a few passersby have seen Jonathan staring into his computer screen and wondered what kind of stuff he writes. This week, some folks here found out. As a number of people have alerted me in the past 36 hours, The Columbia Journalism Review just published a long article by Jonathan on The Point Reyes Light and The West Marin Citizen, as well as on the types of readers in these small towns. 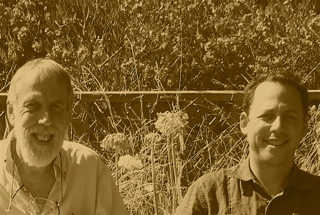 The article titled The Language of Strangers is already online. Jonathan’s piece is accompanied by Inverness writer Elizabeth Whitney’s transcription of the community meeting a year ago in the Dance Palace where residents said what they wanted in their hometown newspaper. Columbia Journalism Review, the best-known trade magazine watchdogging newsrooms around the US, is headquartered at Columbia University in New York City. Every year or so for a couple of decades The Point Reyes Light and I would hear from a woman in Kansas named Melissa Koons. She filled us in on what was happening in her hometown of Newton (pop. 17,000) and on how her own writing was going. Melissa Koons, a free-verse voice crying out on the Kansas prairie. 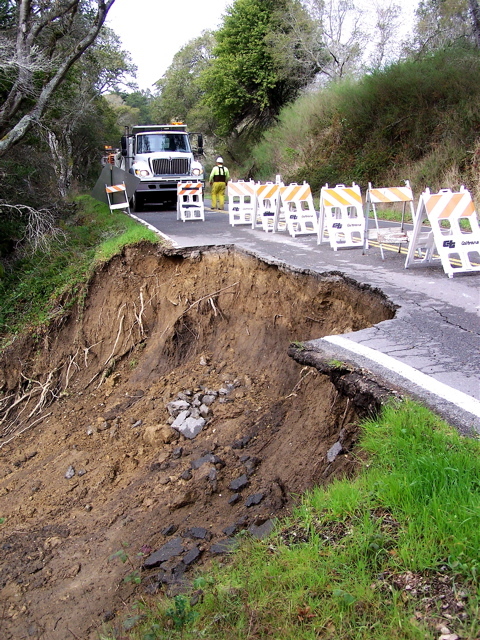 The first of three expected weekend storms blew through West Marin Friday, causing flooding, toppling trees, and closing roads. 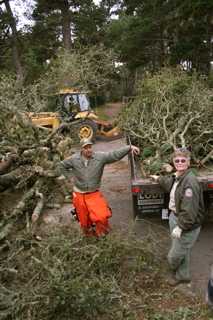 Matt Gallagher of Point Reyes Station (using a shovel for a paddle) and Tony Smith check on Jim and Kathy Love’s levee road home. 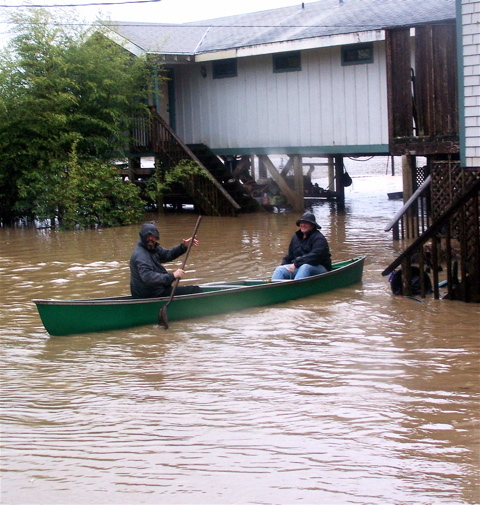 The Loves years ago raised their home on high stilts, so the living area stays dry regardless of what nearby Papermill and Olema creeks do. Friday’s wind speed was at least as high as an East Coast hurricane. On the Beaufort Scale used by mariners, winds reach hurricane force at 74 mph. The National Weather Service considers winds to have reached hurricane force at 80 mph. At 8:33 a.m. Friday, a National Weather Service monitoring station on Big Rock Ridge just east of Nicasio clocked the wind holding steady at 83 mph. Exactly 23 minutes later, county firefighters received a call that a 50-foot-high tree had been blown onto a house at 25 Drakes Summit Rd. in Inverness Park. Although there was “major damage” to the home, no one was injured, Fire Capt. Joe Morena told me. He added that the house was sturdily built. The backstop, infield, and outfield were flooded by Olema Creek Friday at Love Field next to the home of Jim and Kathy Love. 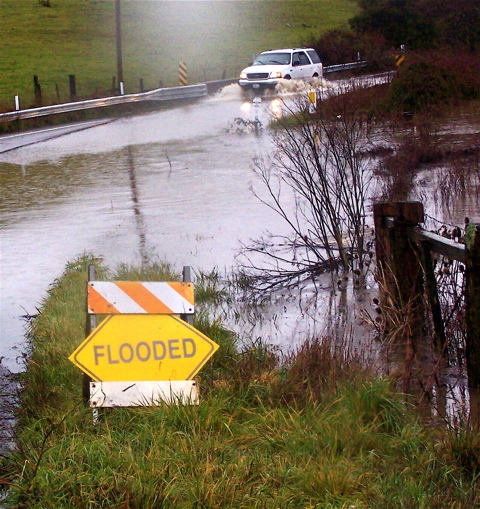 At least four inches of rain fell in much of Marin County, swelling West Marin Creeks, which flooded roadways. 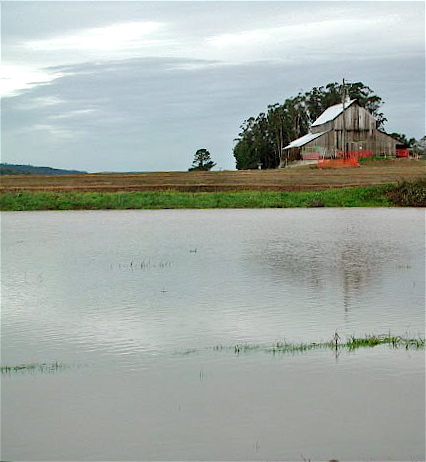 Around noon, Highway 1 was flooded between Point Reyes Station and Olema and between Bolinas and Stinson Beach. 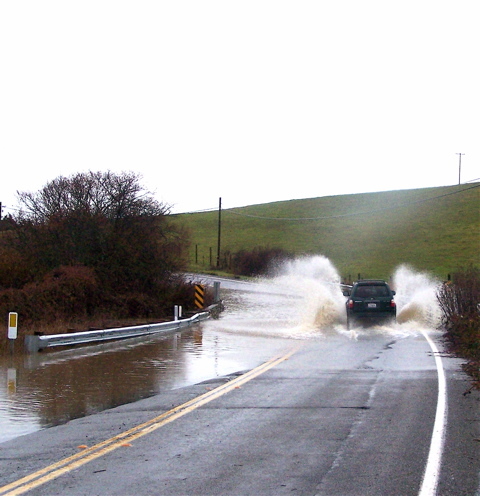 Papermill/Lagunitas Creek flooded Platform Bridge Road and (briefly) the Point Reyes Petaluma Road just east of Highway 1. 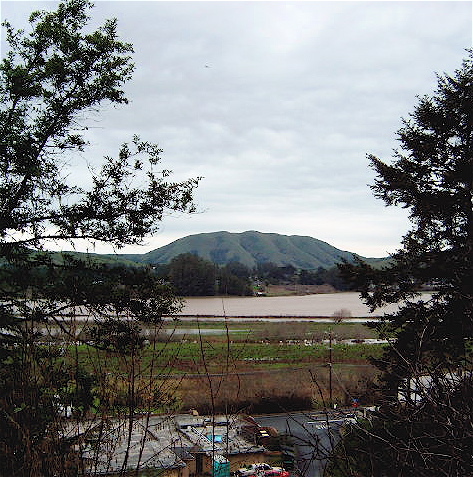 Calle Arroyo in Stinson Beach flooded, and Panoramic Highway leading over Mount Tamalpais from town was closed by fallen trees near Mountain Home Inn. Fallen trees also closed Sir Francis Drake Boulevard in Samuel P. Taylor State Park. Gary Cheda, owner of Cheda’s Garage in Point Reyes Station, told me his towtrucks pulled two cars and a van off flooded Highway 1 just south of town. 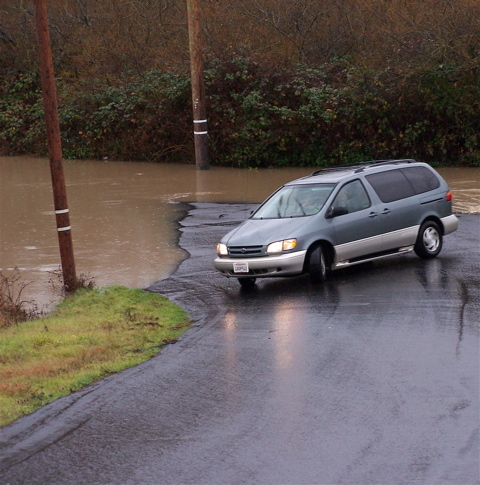 Gary said motorists increase their chance of stalling if they don’t proceed slowly on flooded pavement. Driving faster kicks up water into the engine compartment. When water gets into the cylinders, it can’t be compressed and piston rods are bent, he explained. Although the creeks are not saltwater, Gary noted, they nonetheless are brown with “grit,” which also is bad for car engines. Grit can into engine rings and seals where it sometimes causes expensive problems, he said. In addition to flooding, fallen trees and limbs that blocked roads made driving difficult throughout West Marin Friday. The fire captain told me county firefighters from the Point Reyes Station firehouse spent much of Friday clearing away downed trees. After this cypress tree blew down across Highway 1 on the north side of Point Reyes Station Friday morning, county firefighters partly reopened the road, but the northbound lane remained blocked all afternoon while firefighters and Caltrans dealt with crises elsewhere. Broken limbs also brought down powerlines, and parts of Nicasio were without power for a day and a half. Olema and parts of Inverness experienced shorter blackouts. 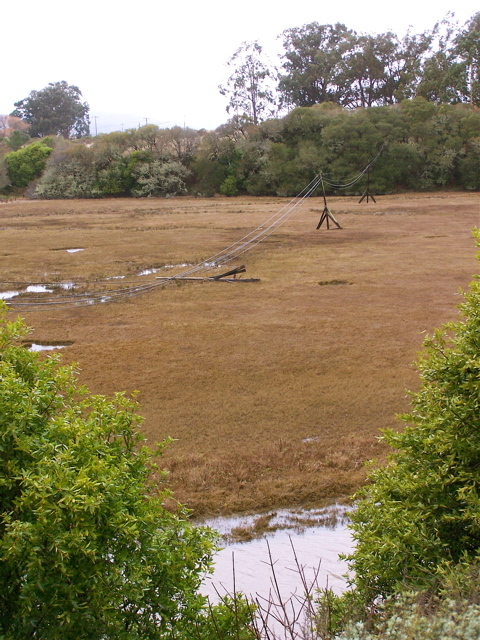 Overall, relatively few West Marin residents experienced more than momentary blackouts compared with residents of East Marin (especially Sausalito, Mill Valley, and Fairfax). Nonetheless, downed powerlines can be shocking, and this one at Cypress and Overlook roads in Point Reyes Station sparked a (very small) fire notwithstanding the rain. Art and Laura Rogers of Mesa Road in Point Reyes Station found their road flooded by Tomasini Creek at noon Friday and had to take another route downtown. 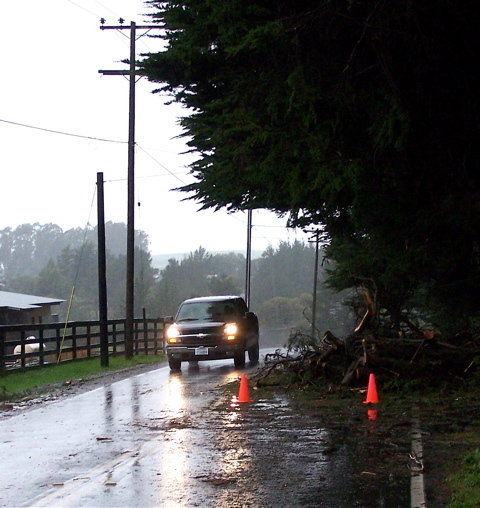 Not only did downed lines, fallen trees, and flooding make it difficult for motorists to leave West Marin, Sheriff’s. 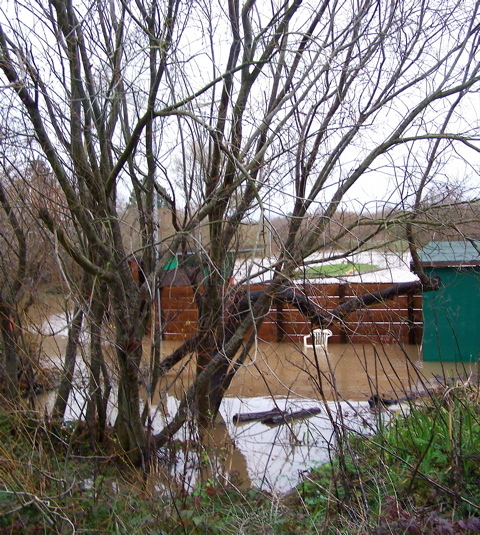 Lt. Doug Pittman issued a plea over KWMR for West Marin residents to stay at home. Over the hill, traffic was in “gridlock,” he said. The problem again was high wind. Shortly before 11 a.m. Friday, it blew over five semi trucks traveling in both directions on the Richmond-San Rafael Bridge, leading to bridge closures off and on all afternoon. But that was not the worst of it. Within an hour of overturning big rigs on the Richmond-San Rafael Bridge, the wind blew construction plywood and planks onto Highway 101 in San Rafael. Clearing away the construction material, which came from the new Highway 580 overpass, and making sure no more would blow down halted Highway 101 traffic for most of Friday afternoon. At various times, vehicles were backed up 10 to 20miles in both directions on the freeway, and thousands of motorists detoured onto surface streets in East Marin. Bad as the weather was in West Marin, most residents had reason to be prepared; the county fire department Thursday afternoon called virtually every household here with a recorded message that warned about the severity of the stormy weather to come. Sparsely Sage and Timely is powered by	WordPress 4.9.10 and delivered to you in 0.408 seconds using 39 queries.